Two trips to Adelaide in two successive weeks – one this Wednesday and the other the following Friday. I have one run to Elizabeth in November for the Commission and one in December for the Conference and that will be me for the year. I don’t have to move out of town until next February. All of this, of course, depending on no medical trips to Adelaide – although I don’t foresee any. I have spent the last few days working in the garage and clearing that out and this afternoon, after a medical appointment, I will get changed and work on the retaining wall. This weekend – as I said earlier – I have four fundraising events for the Royal Flying Doctors. I’m doing the first one tomorrow and I am not looking forward to getting up at 5am. :o). I may leave the back until tomorrow and do some work out front. 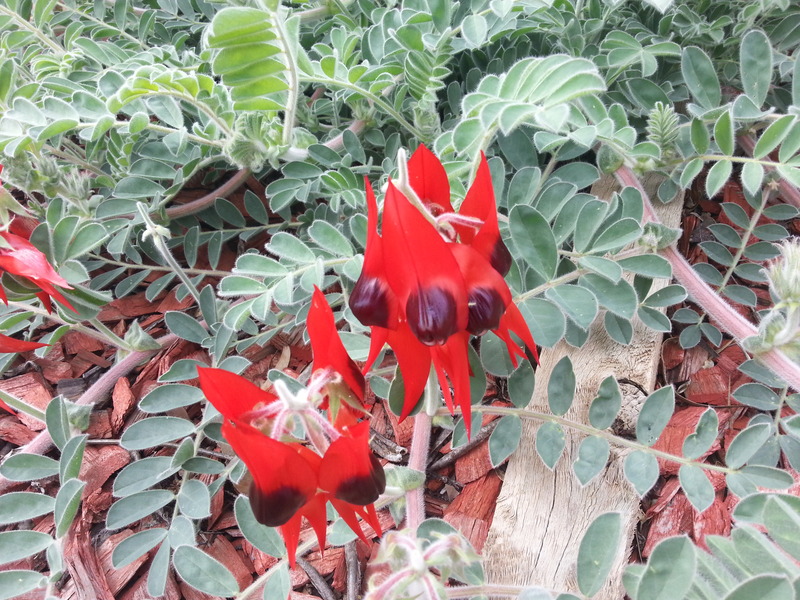 The Sturt’s Desert Pea is now past its best and looking very scraggy and untidy so I will cut that back. The Desert Rose is blooming well enough but somewhat untidy. I am, however, reluctant to do anything about it at the moment. I really don’t want to prune it just yet. The flies have been atrocious these last few days and I have taken to wearing a thing for my hat. I think I did mention this once before but they (the flies) were driving me nuttier than I already am. 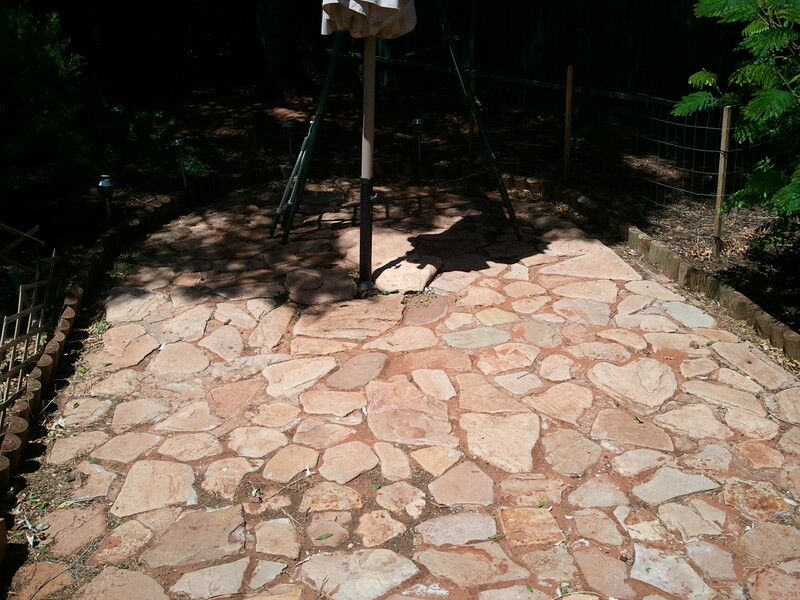 Aft er I cut back the Desert Pea and swept up I put a new bench in the garage and sorted out the old bench, so now I just have oi tidy up the garage and put things away in their new places and I can get back to the retaining wall. In the meantime herself would like me to shift the clothes line to a new location. I told her I’ll add it to my “to do” list, which I don’t think impressed her too much. I will get around to it – in the fullness of time :o) I have actually I’ve had a look at it and I will have to dig up the unit that holds the clothes line in place. That should not do too difficult. It will simply mean getting a new unit and cementing that one in instead. Piece of Celery (I’m not allowed cake) Still leaves me with the problem of the “crazy paving” and that very uneven surface and unless I sort that out she will still have difficulty using that area. On the photograph it looks not too bad but it is only when you get up close and personal that the uneven nature of the stones becomes apparent – and remember I didn’t do this; it was here when we bought the place. I did look into bonded aggregate but that’s very expensive – even to get the resin and the other materials and do it myself. I’ve thought about rubber matting and artificial turf. Not really sure what I can do here but as it is it is too uneven and thus dangerous for Herself to walk on. The Man is causing concern in that he has loosing his eyesight faster than expected, he keeps trying to bite me when I touch him, but once I survive the attempts to bite and set him down next to his diner, he eats well enough. I still hand feed him in the morning ( and he doesn’t try to bite me then) and slip in his medication. He refuses to use the stroller and he gets very stroppy when I lift him because the walking is too much for him. I put him down because I consider it much safer to have him on the ground than have him struggle too much and fall out of my arm and onto the hard surface of the road, or the hard ground. He still runs around the house and from time to time he bangs into things – including me. He was outside today and we heard him yelping, on and on so we went out to investigate. 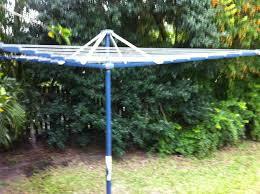 Now you may remember that herself asked me to shift her washing line and I was in the process of doing just that. The Hills Hoist is fitted inside a metal sleeve which is dug and cemented into the ground. I had dug the hole but with all the new housing being built around the place, the sleeves were out of stock at all three hardware shops. I was talking to herself when we heard the yelping. At first we thought it was just his normal yapping at a blank wall, but it went on so we investigated and found — yes you guessed it the Man had gone into the hole and could not get out. I mean it’s not a great big hole, but he managed to get stuck in it. Anyway, I lifted him out and as a thank you Daddy, he tried to bite me – again. I am so glad he has no teeth :o) We have put a bucket in it for the moment – until such times as I can get a sleeve from somewhere – probably Adelaide next weekend.